Cream deckle-edged card 126 x 178mm (5" x 7") with red/cream/green marbled background. 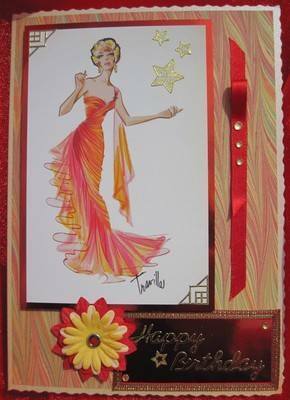 Panel shows movie star in orange-red evening dress with gold star detail, on red mirri card, also used as a Happy Birthday panel embossed in gold. Red ribbon and a red and cream flower complete this elegant card. 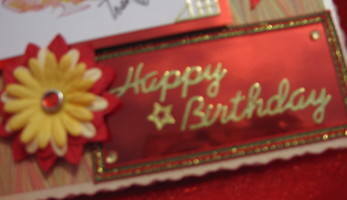 Can also be made without the Happy Birthday box, in which case, dress panel is placed centrally as in 'Grace' design. 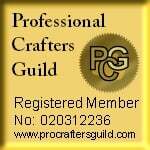 Please use the Personalise form to specify a greeting for the paper insert.